FORT MYERS, Fla., Jul 11, 2018 (SEND2PRESS NEWSWIRE) — As of July 2018, Papa Inc. expands to the Fort Myers and Naples markets to assist seniors and elders with transportation, household chores, teaching technology, and companionship. Papa recruits college students, and bridges the generational gap of young adults and senior citizens through their platform. Currently Papa has 300 Papa Pals on board who have the freedom to choose their schedule. In the upcoming weeks Papa will be searching for qualified candidates at Florida Gulf Coast University, Florida Southwestern State College, Hodges University, Southwest Florida College, and Nova Southeastern University to join their team. “We have found that Papa Pals that join our platform and go through our rigorous onboarding process are more productive and engaged. They have the power to choose their own hours and we have created an environment that lets our Papa Pals be independent,” said Andrew Parker, founder and CEO of Papa. According to a study by Bentley University (*see note 1), 77 percent of Millennials say that flexible work hours make the workplace more productive for people their age. “Our Papa Pals go through different personality tests because we understand the importance of their role, and that’s why we make sure they are a right fit. Our Papa Pals love it because they are learning hands-on experience and our members feel comfortable, safe, and heard,” said COO Alfredo Vaamonde. Because of its growing demand, Papa is now in 9 cities and plans to offer its services throughout Florida by the end of the year. The platform is growing rapidly and many active senior members benefit from this Miami start up. Seniors who do not have a car or family member that can assist their needs at any given moment request a Papa Pal, also known as a Grandkid On-Demand. 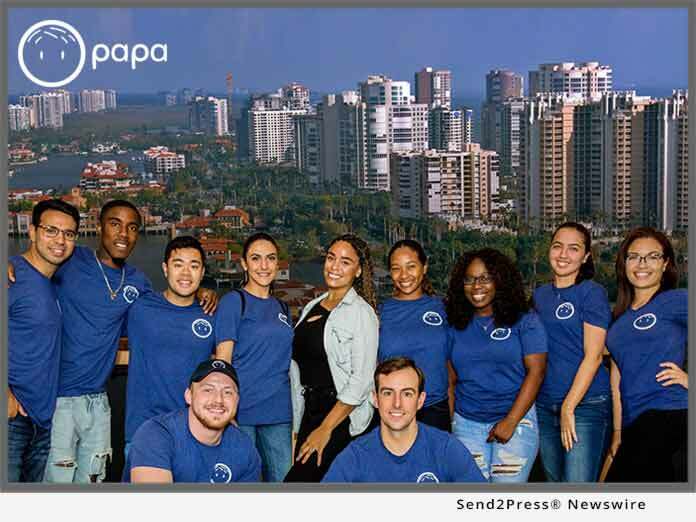 Papa Inc. is a Miami startup that opened late 2017 and has on-boarded over 300 Papa Pals to provide assistance and companionship to its senior members throughout South Florida, Sarasota, Tampa, Fort Myers, and Naples. Papa plans to expand to 8 different states at the beginning of next year.